Rumble on the basketball court. Shan Shan approves of these noodles. After multiple fake-outs by the show that tricked us into thinking that Li Shu is out of the picture, it looks like it’s for real this time. Finally, amirite? There was never any room for her in the Shan-Teng equation. With that obstacle gone, the road to reconciliation looks smoother than ever. Let’s make it happen sooner than later because we’ve been missing our regular doses of Shan-Teng cuteness! Right when Shan Shan wakes up in the hospital from her surgery, she sees Feng Teng sitting right beside her. He apologizes to her for keeping the Li Shu situation a secret from her, but it was all because he didn’t wanted to protect her. He never realized that the person he’d end up hurting the most would be Shan Shan, and he never gave her the chance to protect himself. Take him back, Shan Shan! She tells him that he must have thought a lot during their time apart. Feng Teng tells her that he has indeed thought a lot about their relationship and the obstacles they face. He asks her if she wants to continue fighting these obstacles together or if she still wants to break up with him. If she does want to end their relationship, he only asks that she promises him that before she finds the right person who can properly protect her, she will allow the ID tag that lists her blood type and him as her emergency contact to watch over her. How can your heart not be melting? Shan Shan doesn’t give him an answer, and tells him that she wants to go back home to her parents. Li Shu visits Shan Shan in the hospital, and Shan Shan tells her that if she’s there to apologize then it’s not necessary. That’s because she’s already accepted her apology from before. What apology? Li Shu says that she’s done a lot of crappy things to her (ya think? ), and she’s already heard from Zhou Xiao Wei that Shan Shan knows how they teamed up to ruin her relationship with Feng Teng. Aha! I bet she’s only running over to apologize because she got busted…yet again. Because Shan Shan is a lot nicer person than I am, she says that if it wasn’t for them trying to embarrass her at that dinner party when she wore bad makeup and clothes, then no one would have remembered that she’s Feng Teng’s girlfriend. Li Shu asks her if this means that she forgives her then, and Shan Shan tells her yes. Not me! Because everything’s always about her, Li Shu says that she doesn’t know why she has such a raging superiority complex because she wasn’t born into a rich family either. The only thing she had going for her was that she got to grow up alongside the Fengs, and they gave her the same opportunities. If it wasn’t for them, she would have gone to a regular college and have a regular job. Is that shade towards Shan Shan?! Guys, I just can’t trust her. Shan Shan then apologizes to her for being overly emotional that day. WHAT. Girl, you got every right to be emotional when you see some other girl kissing your boyfriend! Li Shu tells Shan Shan that she should get back together with Feng Teng, and Shan Shan says perhaps later, but whatever happens between them won’t be because of Li Shu. 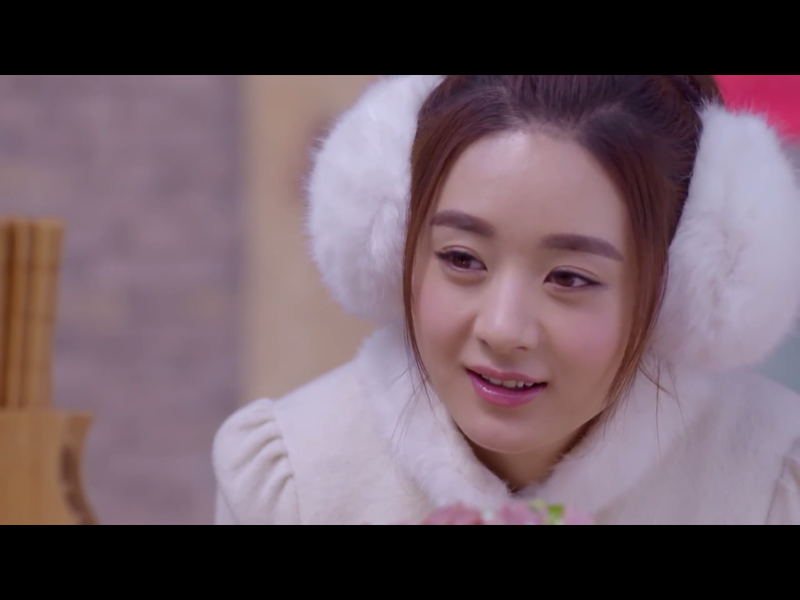 When she’s back at her parents’ house, Shan Shan thinks to herself how she previously overheard the doctor telling Feng Teng and Liu Liu in secret that a side effect from her surgery is that she might not be able to have children in the future. Liu Liu starts to ask Feng Teng what he would do if that were to happen, but he quickly interrupts her to say that it won’t. He asks her to not tell Shan Shan and her family about this. Shan Shan asks her mom if her dad would have married her if he knew that she wouldn’t be able to have children. Her mom knows what she’s referring to because she had asked the Eastern medicine doctor about Shan Shan’s condition. She tells her she’s confident that she will be able to have children in the future, and that she shouldn’t worry too much about it because a relationship is ultimately between her and the other person. She also tells Shan Shan that she shouldn’t waste time worrying about something like this right now when she doesn’t have a significant other yet. But afterwards, Shan Shan thinks to herself that her boyfriend isn’t just some random dude, but is the sole heir to the Feng lineage. She wonders if her mom’s reasoning applies to someone like Feng Teng? Back at work, Zhou Xiao Wei gets promoted to a different department. Everyone figures that her promotion is the deal that she made with Feng Teng when she agreed to donate blood to Shan Shan. Shan Shan is surprised to hear that Zhou Xiao Wei also donated blood to her, and thinks that she only requested Feng Teng to give her a promotion so that people wouldn’t find out that she’s actually a nice person. Okay, if you say so. By the looks of it, Shan Shan thinks that Feng Teng hasn’t told people that he and Shan Shan broke up. Is it to protect her from all the gossip or…is he waiting for her? The latter! Adios ZXW and her bangs. The employees later find out that Zheng Qi is leaving Windgroup to join a rival company in America. A different one than the one that’s currently suing them. Before Shan Shan could even process that info, Feng Yue calls her to tell her to come immediately to the basketball court because Feng Teng and Zheng Qi are about throw it down with each other. Why aren’t the two of them at Windgroup right now? Who did you say was leaving? At the bball court, Feng Teng accuses Zheng Qi for being a traitor because he’s leaving the company amidst the drama and lawsuit. Zheng Qi argues back that Windgroup can choose to do whatever they want with the lawsuit and settlement if he’s gone. Feng Teng says that he was the one that encouraged them to fight back against the lawsuit, so he’s not buying Zheng Qi’s excuse that he’s leaving for the good of the company. Zheng Qi tells Feng Teng that he never sold himself to Windgroup, so he has every right to leave whenever he wants and to go live his own life. Feng Teng says sure, here’s how you can live your life…with my fist punching your face! 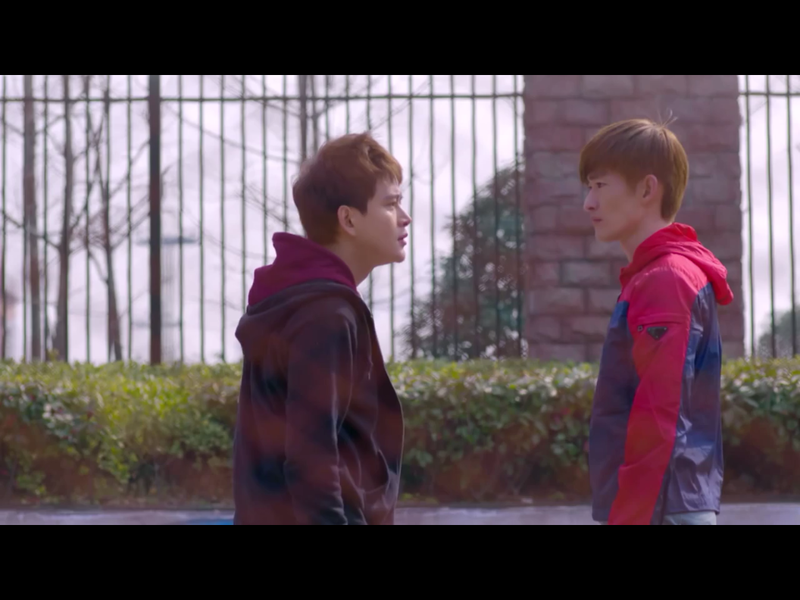 As the boys are swinging punches at each other (and missing), Feng Yue arrive with Shan Shan and Li Shu just in time to break up the fight. After separating them, Li Shu takes Zheng Qi away while Feng Yue and Shan Shan stay with Feng Teng. Zheng Qi tells Li Shu that if she wants him to stay in Shanghai, then he’s willing to do it for her. She quickly shuts that down, and tells him to stop mixing his personal life with business and that they can discuss this later when he’s calmed down. Zheng Qi obviously gets more pissed hearing this and drives off by himself. In the meantime, Feng Yue left Shan Shan alone with Feng Teng to calm him down. Feng Teng asks Shan Shan if all the girls at Windgroup like Zheng Qi because of his carefree lifestyle and attitude. He tells her that he’s actually quite jealous of him. You see, Feng Teng has never had any other options in his life, but to continue the family business. While Zheng Qi and other people are free to do whatever they want with their lives, Feng Teng can’t. Shan Shan thinks to herself that it’s so strange to see the normally cool, calm, and collected Feng Teng in such a vulnerable state. She never realized before how lonely he actually is. Later at the beef noodle stand, Shan Shan orders a regular noodle but sees that her bowl is absolutely filled with extra meat. She asks the owner if there’s been a mistake with the order, but the owner tells her that her boyfriend came by awhile ago to give her extra money for Shan Shan’s food. Boyfriend? Well, that must mean Feng Teng! Shan Shan can’t help but smile to herself when she hears this. Later at her CPA prep course, shady girl tells Shan Shan that if she needs to miss class next time, she can just tell her boyfriend to come pick up the notes from her. Shan Shan tells her that he’s been really busy and hasn’t dropped her off in awhile, but shady girl says that she just saw his car outside. By the time Shan Shan rushes outside, Feng Teng’s car is already gone but Shan Shan now knows that during their time apart, he has still been quietly watching over her. Shan Shan thinks to herself how she’s never considered how lonely Feng Teng is, and how there’s so much about his life that she doesn’t know. As she passes by a dance studio, she remembers how they tried to dance together during Chinese New Year, but she just ended up stepping on his feet the whole time. So, Shan Shan signs up for dance classes! Since Feng Teng gave her the choice of what to do with their relationship, Shan Shan decides that she should gather up her courage to confront any obstacles they may face. Yay, Shan-Teng soon! The next day, Feng Teng sees a news segment about Zheng Qi’s new company preparing to launch a new product into the Chinese market and gets pissed. Yan Qing tells him to not worry so much about that because that company is only trying to rile up the Windgroup shareholders by making them think they’ll have more competition in China. Feng Teng ain’t listening though and declares that he’s moving back out to his apartment in the city for some peace and quiet. Yan Qing later calls Shan Shan because he can’t reach Li Shu, and he tells her that Zheng Qi is leaving today for America. Shan Shan asks him if he’s really joining the rival company out there, and Yan Qing says it doesn’t look like it because he bought a one-way ticket to Philadelphia, and the company is in California. Shan Shan immediately rushes over to the bookstore to find Li Shu and to urge her to stop Zheng Qi from leaving. Li Shu tries to like act like she doesn’t care if he stays or goes, but Shan Shan tells her to snap out of it and to go stop the love of her life from leaving, perhaps forever. But when they get to Zheng Qi’s apartment, they see his realtor there and he tells them that he already left for the airport. 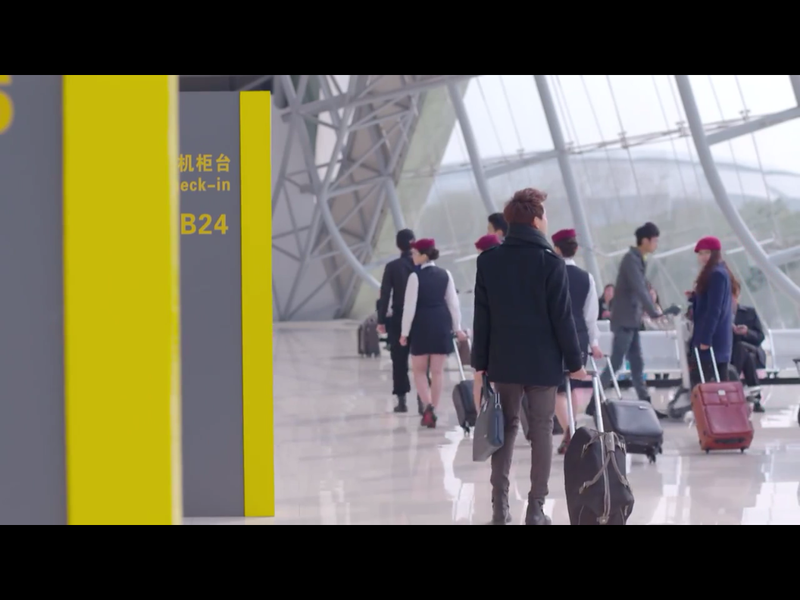 When Li Shu and Shan Shan get to the airport, they see that the flight to Philadelphia hasn’t left yet, but Zheng Qi is nowhere to be seen. As they’re scanning around for him, Li Shu sees someone with his back turned to them but looks suspiciously like Zheng Qi. In her frantic state, she yells across the airport that she likes him. She continues to yell that she likes him and wants him to stay. Sure does look like Zheng Qi. But when that person turns around, it’s not Zheng Qi. Oops. No worries though because Zheng Qi just so conveniently was standing behind Li Shu and Shan Shan when she was confessing her love to him, and he heard everything. They hug and declare their undying love for each other. I guess this scene could have been cute and romantic, but because I’m just so anti-Li Shu that I just can’t get on board with this couple. Off into the sunset they go. Li Shu and Zheng Qi go to Feng Teng’s apartment, and Zheng Qi tells him that he’s going to stay at Windgroup. He really was planning to leave because he thought it was for the best, but since Feng Teng can’t appreciate his efforts, he’ll stay. Feng Teng responds that it seems like he was convinced to stay because of a girl instead of for him, his bro. Truth. Li Shu tells Feng Teng that it was all thanks to Shan Shan that this happened. I wasn’t really buying their whole loved up act here. Feng Teng later texts Shan Shan to thank her for helping him, and she thinks to herself that this is the most she can do for him. At work, Shan Shan runs into Zhou Xiao Wei in the elevator. She thanks her for donating blood to her. Shan Shan tells her that she knows she came to Windgroup to only help Feng Yue in case of medical emergencies, so she’s really grateful that she was still willing to help her. Zhou Xiao Wei tells Shan Shan that’s where she’s wrong because she didn’t come to Windgroup only for Feng Yue, but also for her. Say what now? What is Zhou Xiao Wei’s deal? When she was still at her parents’ place, Shuang Yi is encouraging Shan Shan to get back together with Feng Teng after she saw how attentive and concerned he was when she was sick. Shan Shan tells her that she now realizes how much Feng Teng cares about her, so she really needs to think about whether or not they should be together because it’s pointless if they’re eventually going to break up. As soon as Shan Shan is back in Shanghai, Feng Teng’s butler comes over to bring her Chinese medicine. Shan Shan asks Liu Liu and Shuang Yi which one of them is reporting her every move to Feng Teng, and both of them deny it and blame it on Liu Liu’s boyfriend instead. Yeah, just blame that guy. He’s the worst. Feng Teng’s secretary brings Shan Shan a thermos of Chinese medicine during lunch. Throwback to the lunchboxes! My face during the Shan-Teng breakup period.